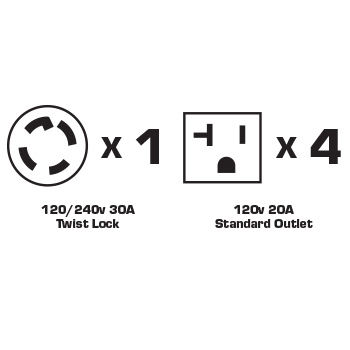 4) 120V 20 Amp Standard Receptacles. Wheel kit with front handle for easy transporting. Run-Time [ @ 50% Maximum Output ]: 8.0 hrs. (4) 120v 20A 3-prong outlets (Standard Household plug).